Lily and Jeff fell into a whirlwind romance, which culminated in an incredible proposal (Jeff had a plane fly over the beach with “The Question” trailing behind). Afterwards, the couple (with help from Christina at Platinum Wedding Events) set about planning their romantic and fun destination wedding in San Francisco. A ceremony at SF City Hall would be the centerpiece of their experience, but they had much more in store for their guests. Two cable cars whisked them away to the Golden Gate Bridge, and, via Lombard and North Beach, over to Perbacco for a lavish reception. San Francisco obliged with clear blue skies and a beautiful 75-degree day. From the looks of it, Lily and Jeff and their guests had an amazing time! Congrats, guys! 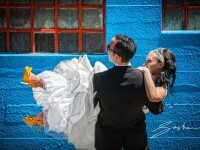 For the full story, check out Jeff and Lily’s San Francisco City Hall wedding photography.